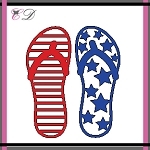 Vickie Y sharing a fun summer card using the Flip Flops die. I live in my flip flops during the summer and well into the fall! When the snow flies I become a little sad because I put my flip flops away and wait for the next warm, sunny day to bring them out again. But, with the flip flops die I can create that flip flop warmth anytime of the year! Those flip flops are so wonderful. I think I might like to have that die.